The Mix in Wantage town centre is holding a drop-in gaming session on Saturday from 10.30 am until 2.30 pm. Members of the club are providing games and will be teaching people how to play them. There isn’t an awful lot of space so the idea is to encourage people to drop in and play a short game or two. We are planning to bring a few eye-catching games like PitchCar, Riff Raff, Bamboleo, Toc Toc Woodman, and Saturn, but most of the gaming will be smaller filler games like Dobble, Turf Horse Racing, No Thanks!, Walk the Plank!, The Great Balloon Race and some of our other light favourites. We will also be bringing some classic gateway games like Carcassonne, Ticket to Ride, The Settlers of Catan and Jamaica as well as a small number of deeper games, just to show people what else is out there. 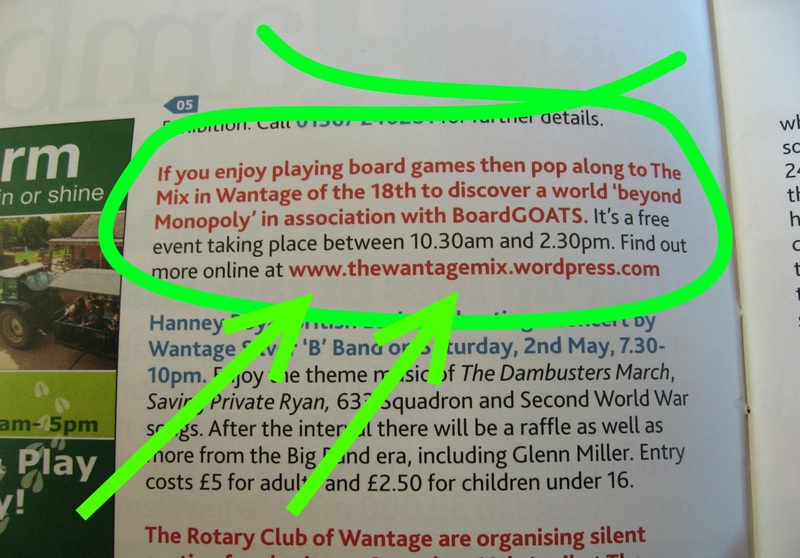 The event has been well advertised and was mentioned in the Ramblings section of the April edition of the local magazine, “Round and About”, so we are hoping for a decent turn-out. Please pop in if you are in the area on Saturday. This entry was posted in News, Other Events and tagged Bamboleo, Carcassonne, Dobble, Jamaica, No Thanks!, PitchCar, Riff Raff, Saturn, The Great Balloon Race, The Settlers of Catan, Ticket to Ride, Toc Toc Woodman, Turf Horse Racing, Walk the Plank! on April 14, 2015 by nannyGOAT.